I have had a request from a reader for how to cook stockfish (stoccafisso or pescestocco in Italian and piscistoccu in Sicilian). She plans to cook it for Good Friday. There are two recipes for how to cook salt cod (baccalà) on the blog already (see links below) and these recipes can also be used for stockfish (stoccafisso). What I have not done on my blog is to say what the differences are between stoccafisso and baccalà. The photo above was taken in Syracuse. The seller is selling baccalà (the large fillets of white fish). Stoccafisso and baccalà are popular all over Italy, from north to south. 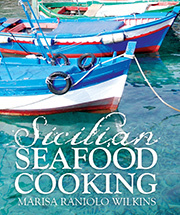 Baccala`is cooked all over Sicily, but stoccafisso is particularly popular in Messina (n0rth-eastern corner of Sicily). Although at times stoccafisso and baccalà are used interchangeably in recipes, they are different. Stoccafisso is air-dried, without salt, and the fish can be cod, haddock or hake. It is dry and hard and usually sold as a whole fish, complete with bones and skin. ( In the photo above Stockfish is hanging from the top of the counter at Mercato in Adelaide). Baccalà is salt-cured cod. In Spanish it is bacalao, in Portuguese bacalhau, in French morue, and it is made from various varieties of cod: cod, ling, saithe and tusk. It is relatively moist and tender and usually sold cut into sections rather than a whole fish. It is skinless, boneless and white. Although baccalà may appear initially to be more appealing, there are no added ingredients in the processing of stoccafisso and it has a more delicate flavour than baccalà. Stoccafisso and baccalà can be cooked many ways and were usually eaten on days of abstinence (Fridays and during Lent, especially on Good Friday ) when meat was not to be eaten by Catholics. Christmas Eve is also a very popular time to eat stoccafisso or baccalà . To prepare both the stoccafisso and baccalà rinse well and soak it in cold water for 20–24 hours, minimum, depending upon its thickness (refrigerate it in hot weather). Change the water 2–3 times daily. 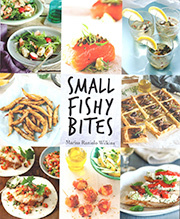 I have seen recipes that suggest soaking the fish for 48 hours – time you soak it depends on the quality and age of the fish, but it will not suffer too much if it is soaked for longer. Once it has soaked, rinse the fish well. If it is stockfish, skin it, pick out the bones and cut it into large pieces (130mm) and it’s ready for use. Baccalà generally takes longer to cook than stoccafisso but it will depend on the thickness of the fish. Stoccafisso and baccalà require soaking in water before cooking: stoccafisso needs soaking for several days to rehydrate it and baccalà requires an equal amount of time to remove the salt. Most Italian and Spanish food stores sell pre-soaked stoccafisso or baccalà and is ready to use. Remove cartilage, bones and skin of the stockfish before cooking. This photo was sent to me by a friend. They are the racks used to dry stockfish near Honningsvåg in Norway. Carmela, one of my parents’ friends, cooked stoccafisso alla ghiotta for me many years ago in Adelaide. Originally from Messina, Carmela came to Australia as a young woman. Her version had tomatoes in it, but it can be cooked without tomatoes as well and called in bianco (white/ without tomatoes). Soak the stockfish and prepare it according to the instructions above. Add the celery and onion to hot, extra virgin olive oil. Use a pan large enough to accommodate all of the ingredients, and cook until soft, about 5 minutes. Stir frequently to cook evenly. Reduce the heat to medium; add the capers, olives, and flat leaf parsley and stir well. Add the tomatoes, season with salt and freshly ground pepper, stir, and cook for about 10 minutes to blend the flavours. Place the fish in the sauce (preferably in a single layer) and spoon some of the sauce over it. Reduce the heat to very low – the fish should not be stirred or it will flake. Cover, and cook for about 20 minutes before adding large chunks of potatoes. If you are using baccalà instead of stoccafisso you may need to cook it a little longer. Add 1–2 cups of water and leave undisturbed to cook, but occasionally adding a little more water to keep the ingredients moist and until the fish and potatoes are cooked to your liking. This dish is always served hot, but can easily be reheated if cooked beforehand. Photo below was taken in Macau where I saw many baskets of cod drying in the street. Gillian began the presentation with short history of food and feasting in Sicily. Gillian focused on the literary and archaeological evidence for food production and consumption in the ancient world of Sicily with particular emphasis on festivals, sacrifice and feasting (i.e. pagan “versions’ of Xmas). She described how in ancient times the ordinary people only got to eat meat as the result of sacrificial offerings to the gods (the gods inhaled the smoke and aromas as the sheep and goats, and less often cattle, were roasted). Using our dining room wall as a screen, Gillian projected images of temples and townships, altars and cooking implemenents and a map of Sicily to clarify and enrich the presentation. She also showed the guests examples of formelle from her personal collection. Formelle are special, handmade ceramic moulds that were traditionally used to make decorative mostarda (must and ash paste) and cotognata (quince paste, I provided the recipe). Gillian is a compulsive collector of formelle and was able to tell me about a formella that I have inherited from my paternal Sicilian grandmother. For my presentation, I talked about the similarities and differences between the ancient recipes recorded by Archestratus and Apicius and what are now traditional Sicilian recipes. The menu I selected for this event reflected the development of the recipes and methods used from the ancient world into the Sicilian recipes, the influences of the seasons, religion and culture of Sicily, which in the course of 3,000 years has layered Christianity over Islam and Roman, Greek and more ancient religions. As the theme of the presentation was Christmas cookery, I focussed on fish and vegetables since Sicilians observe the Catholic rituals of Advent, which involves a month of fasting. The Christmas meal for Sicilians happens on Christmas eve, when they traditionally eat fish. Gillian helped explain the connection between fish and Christ, referencing the Greek word for fish, icthos, which in the early christian era was the symbol most more closely identified with Christ than the cross and whose letters were used as an acrostic, to spell out in Greek, Jesus Christ Son of God, Saviour. This is my third Workshop organised by The Ancient Mediterranean Studies at La Trobe University. Buccello (bucciddatu in Sicilian), a round ciambella (ring-shaped cake) eaten at Christmas with a stuffing of dried fruits and nuts enclosed in crumbly, short pastry. This was made by pastrychef Marianna from Dolcetti. Baccalà is traditionally eaten on Christmas eve in Sicily. The ingredients are sufficient for a main meal for 4 people. A common Sicilian method of cooking food is ‘alla ghiotta’and it usually contains green olives, capers and celery. Stockfish or Baccalà alla ghiotta in bianco is cooked without tomato and is more commonly cooked in the winter months –culinary term, white — with little seasoning and definitely without tomato. The cod can usually be bought from Italian or Spanish supermarkets. You need to begin preparations at least two day before. Some salt cod is pre-soaked by the vendors beforehand, so it is best to ask about this when you buy it. Soak the fish to remove the salt. Rinse any excess salt off the cod, then put it into a large bowl and cover with cold water. Leave to soak in the fridge for 3 days, changing the water three to four times a day. Cut any fins or tails off the cod pieces and remove any obvious bones. Cut the soaked cod into pieces about 10cm in length. Add the celery and onion to hot, extra virgin olive oil. Use a pan large enough to accommodate all of the ingredients, and cook until softened (about 5 minutes). Stir frequently to cook evenly. Reduce the heat to medium; add the capers, olives, parsley and stir well. Add freshly ground pepper, stir, and cook for about 10 minutes to blend the flavours. Place the fish in the vegetables (preferably in a single layer) and spoon some of the vegetables over it. Add about ½ cup of water (or wine, optional). Reduce the heat to very low – the fish should not be stirred or it will flake. Cover, and cook for about 35 minutes before adding chunks of potatoes. This dish is always served hot, but can easily be reheated; the flavours improve if cooked beforehand. Dr Gillian Shepherd is Lecturer in Ancient Mediterranean Studies and Director of the A.D. Trendall Research Centre for Ancient Mediterranean Studies at La Trobe University.Gillian studied Classics and Fine Arts at the University of Melbourne before going on to complete a PhD in Classical Archaeology at Trinity College, Cambridge, followed by a research fellowship at St Hugh’s College, Oxford. Until her recent return to Australia to take up her position at La Trobe University, Gillian was Lecturer in Classical Archaeology at the University of Birmingham, UK. Her research interests are the ancient Greek colonisation of Sicily and Italy, burial customs, and the archaeology and art of Greece and Magna Graecia. Both my grandmothers always added baking soda (bicarbonato) to the soaking water when cooking chickpeas (ceci in Italian). Mind you, they also dissolved bicarbonato in water to help their digestion. Old habits die hard: just because her mother had done this, my mother also did this, but by the time I was old enough to cook chickpeas these unnecessary habits stopped. Evidence found in archaeological sites all around the Mediterranean indicate that chickpeas have been around for a very long time – since Neolithic times and in the early Bronze Age. These legumes were important food sources in countries like in Cyprus, Iraq, India Turkey, Egypt, Crete and Southern Italy – they were grown in Pompeii to feed the Roman empire. Chickpeas are mentioned in the Iliad by Homer and by Pliny, and continued to be a popular food source in all of these countries. In more recent times ceci have a prominent place in Sicilian history. On Easter Monday, March 30, 1282 in Palermo, Sicilians were waiting to attend Vespers (church service). Here occurred the beginning of a rebellion which had been brewing for a long time – Sicilians were against the rule of Charles I of Anjou, ruler of Sicily and they took the opportunity to use a trivial event to massacre the Frenchmen who were identified by their inability to pronounce the word for chickpeas without their inevitable lisp. Below, the Arno River. Featured image, the Arno in the snow. On the anniversary of this Sicilian Vespers event it is time to celebrate another recipe for chickpeas, this time not with a Sicilian recipe, but one from Florence – baccalà e ceci. This dish of course of is also be suitable for Good Friday – a day of fasting and abstinence in the Catholic Church. 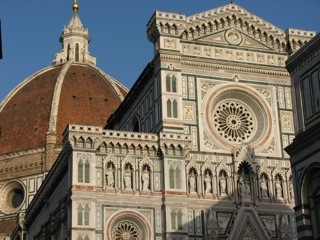 And why a recipe from Florence? This came about because my brother and sister in law visited Spain last year; we recently discussed how they particularly had enjoyed eating bacalao in Spain with chickpeas and how many of the Spanish recipes seem very similar to the Italian ones. I was in Florence a couple of years ago and ate baccalà in a small trattoria; it was not the usual baccalà alla fiorentina which is made with tomatoes, parsley and garlic and of which different variations exist and with different names, all over Italy and not just in Tuscany. There are a number of particularly similar Catalan and Florentine recipes of salt cod and chickpeas; the following recipe is from Florence and although there are many variations in the cooking of baccalà con ceci, the following has the flavours that work for me. It is also a complete course and pretty balanced. Thick pieces of salt cod (cut from the centre) are best. Leave the skin, but cut away fins and obvious bones. Cut into pieces (7- 10cm). Rinse well in running water before soaking for 36-48 hours (over soaking will not spoil the fish, especially if the pieces of baccalà are thick). Keep it covered in a bowl in the fridge. Change the water at least 4-5 times. 1 k of baccalà serves 4-6 people. Soak the chickpeas in water overnight for 8 – 12 hours. Cover the chickpeas with fresh water, cover and bring them to the boil, Cook until tender. Drain the cod and squeeze out excess water. Skin the fish and pat dry. Cut it into serving pieces (5cm each). Add some oil to the pan and lightly fry the cod on both sides. Remove from the pan and discard the oil. Soften the leeks and the herbs in the rest of the oil – use a thick bottom pan that will hold all of the ingredients. Add the tomatoes, chillies, garlic, and wine and stir these ingredients to incorporate the flavours. Add the cod and pepper and cook slowly for about 20 mins. Add chickpeas, taste for salt and add it if necessary. Cook slowly for another 20mins. At this stage the cod should be cooked and the sauce and chickpeas should have a creamy consistency. Cook for longer and add more liquid if necessary. Add cooked and drained silver beet (chard) or spinach or serve the baccalà and chickpeas with a separate contorno of spinach (first blanched and then tossed in some hot oil and garlic or hot oil, toasted pine nuts and a few pre-soaked sultanas). 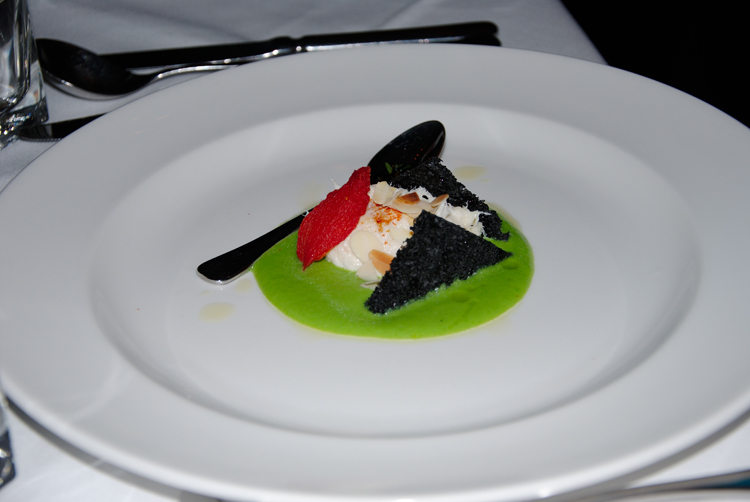 On Monday, 15th March I attended a dinner at Society Restaurant, Melbourne. Massimiliano Ferraiuolo is a chef (originally from Naples) who is visiting from Italy for a week’s residence at Society Restaurant and cooking each evening. The event is part of The Melbourne Food and Wine Festival and is called Around Italy in 7 Days – Travel north to south with a different gastronomic journey each night. As you know, there is no such thing as Italian food, you have to specify the region and this event began with a menu with dishes from the Dolomiti, a group of impressive mountains in the eastern section of the northern Italian Alps. Living in Trieste as a child I know and visited the nearby towns Sappada and Corina D’Ampezzo, where I ate rustic food in trattorie. This was not what I remember eating in the trattorie (domestic traditional), but I was not disappointed. The food was of high quality, very professional, adventurous and modern, beautifully presented on the plate and with the flavours and ingredients faithful to the region. I say modern, because the duck and the venison fillet were served rare (as is in let’ s say the France tradition). The service was excellent .There was also generosity with the wine – the glasses kept on being filled. The event first advertised Sicily as the final destination. Unfortunately diners will need to make do with evenings in Naples (Chef’s home town so this should be good) Sardegna and Puglia. Mi e`piaciuto tutto quello che hai preparato e ho apprezzato la difficoltà che hai avuto per trovare i prodotti adatti. . Forse quello che mi è piaciuto di piu’, è stato il baccalà mantecato – lo mangiavo spesso a Trieste…. e quegli gnocchetti Tirolesi. Complimenti a tutti in cucina. (And all staff). Pan seared duck with asparagus and artichokes. Venetian dried cod with pea mousse and rye bread (photo). Tyrolean dumplings, with fondant cream cheese sauce and shallow fried proscuitto di Parma (photo). Venison fillet pan seared with autumn vegetables (photo). Venison shanks (slow cooked) in a red wine jus with cherries, potatoes and black pepper. Pistachio crème brulee with lemon and olive oil ice cream and fresh fruit. Fresh berries and nuts dipped in bitter chocolate, an amaretto and some caramels. (It was even covered with snow (icing sugar) from the Mountains. See feature photo.